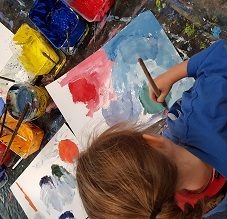 Participants will explore the world of colour mixing and have fun combining paints to create a background of colours that represent their family. Children will then create drawings of their family or home to layer onto their background producing a mixed media artworks to take home. Participants to bring photos of family and/or home; wear apron/old shirt, closed-in shoes.